*This sections contains the information of the generic configurations required to import data from Project Service Automation application (PSA) to Microsoft Dynamics 365 for Finance and Operations. A new module has been created for these integrations and it has the following forms within it. Contracting unit mapping: where the contracting unit of Project Service Automation application (PSA) is mapped to a Legal entity in Microsoft Dynamics 365 Finance and Operations. 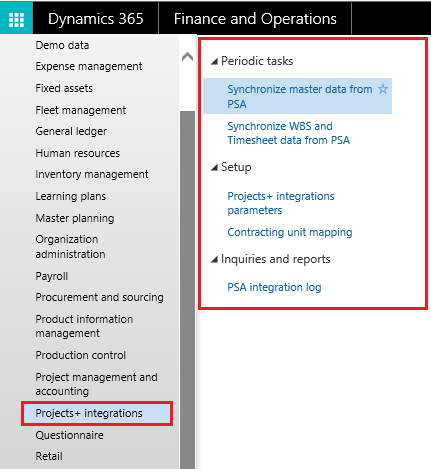 Synchronize master data from PSA: where the master data of Project Service Automation application (PSA) can be Synchronized with Microsoft Dynamics 365 Finance and Operations. Synchronize WBS and timesheet data from PSA: where the users can synchronize WBS and Timesheets from Project Service Automation application (PSA) to Microsoft Dynamics 365 Finance and Operations. In the Inquiries and reports area. PSA Integration Log: which has the log of all the integrated records. This form allows the mapping of Project Service Automation application (PSA) contracting unit with Microsoft Dynamics 365 Finance and Operations Legal entity to integrate records. Integrations work only for the mapped entities. Company: This is the entity of the Microsoft Dynamics 365 Finance and Operations where the records from Project Service Automation application (PSA) will be integrated. Contracting unit in PSA: This is the entity of the Project Service Automation application (PSA), from where data will be taken to integrate into the Microsoft Dynamics 365 Finance and Operations. The parameters setup in this tab will be common for all integrations. Here the Project Service Automation application (PSA) information is entered and this information is used while integrating the records from Project Service Automation application (PSA) to Microsoft Dynamics 365 Finance and Operations. Go to Projects+ integration > Setup > Projects+ integrations parameters. PSA URL: URL of Project Service Automation application (PSA) from where data needs to be imported. Username: Enter Project Service Automation application (PSA) user id to integrate the data from Project Service Automation application (PSA), selected Project Service Automation application (PSA) user should have access to entities. Password: Password for the above mentioned Project Service Automation application (PSA) user needs to specified here.